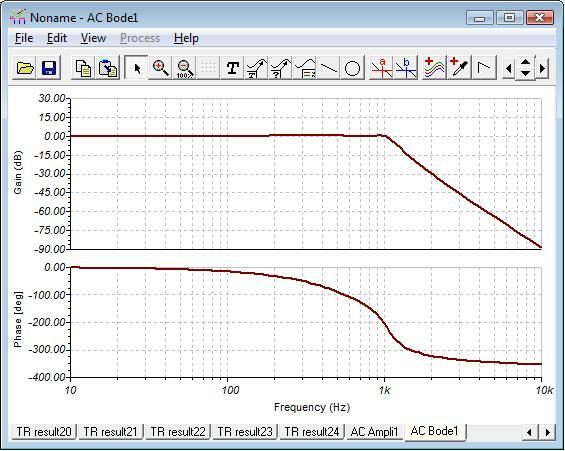 DC analysis calculates the operating point and the transfer characteristic of nonlinear analog circuits. Through optimization, TINA will optimize a circuit response to a predefined target value by automatically varying the value of a circuit parameter. In AC analysis, complex voltage, current, impedance and power can be calculated, and Bode diagrams, Nyquist diagrams, and group delay characteristics can be plotted. In transient analysis, the transient response of analog and mixed analog/digital circuits can be plotted. In all analysis modes, parameter values can be both stepped and swept, and ambient temperature can be varied.